Personalised baby bib beautifully embroidered with babys name and and heart and a subject of your choice all in a kids handwriting font. Personalised baby bib beautifully embroidered with babys name and and heart and a subject of your choice all in a kids handwriting font. Just enter the text you want sewn and we will personalise the bib in your choice of thread colour. You can also choose the bib colour you want. Personalised baby bib beautifully embroidered with babys name and and heart and a subject of your choice all in a kids handwriting font. 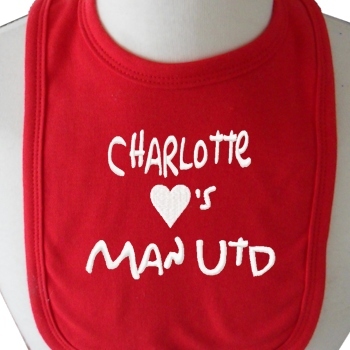 Just enter the text you want sewn and we will personalise the bib in your choice of thread colour. You can also choose the bib colour you want. The bib is good quality made in the UK 100% double layer cotton pullover bib to help keep clothes dry and free from stains and is easy on and off pullover - no fiddly knots to tie. Bib colours available; White, Black, Blue, Yellow, Pink, Red. Please fill in the wording you would like embroidered in the boxes provided (please check spelling). Select the thread colour you want. If you have any questions or requests please email us. All embroidery gifts are especially made to order by Amys Gifts, we do our best to get all orders dispatched within approx 24-48 hours.